use of expansive negative space. This means you can throw the quilt in the washing machine. I see a lot of modern quilts used as wall hangings and they function as art, but you could still throw them in the wash and they don’t need to be sent to the dry cleaners. I take this “functional” label to mean they aren’t embellished with beads and such. Expansive negative space uses large areas of the same color of fabric and it seems to use minimal piecing. 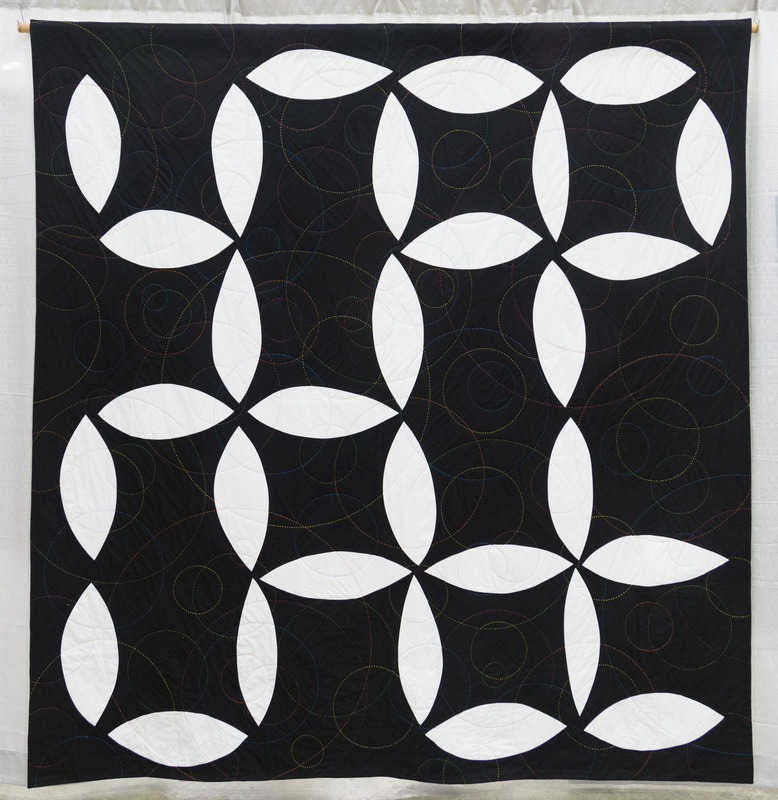 I like the use of large areas of solid fabric in a quilt, but to make it functional, that negative space needs quilting and all that free motion quilting seems to me to be no different than piecing. Either way there is a design in that space. Thread versus piecing — I don’t know the answer to what is negative space. Maybe it has to read as a solid background and it has nothing to do with negative space design. 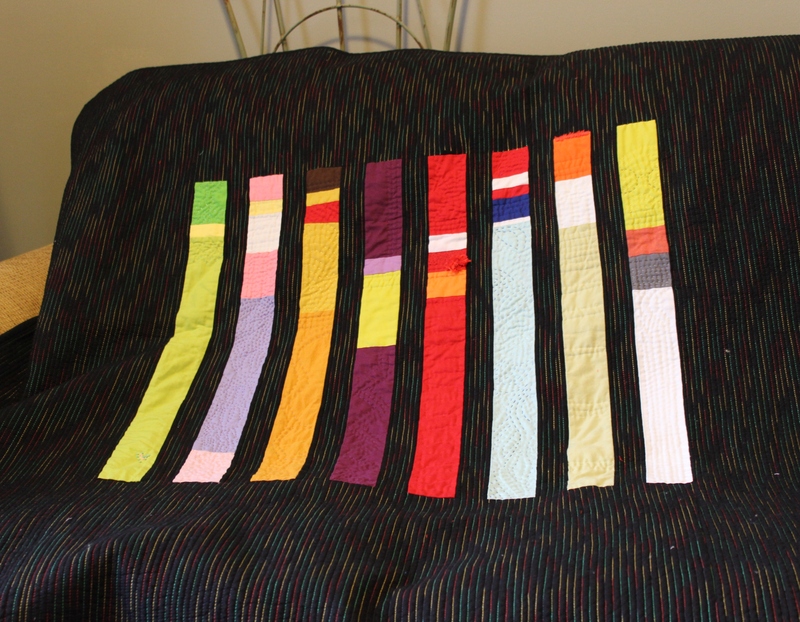 The blog, KnitNkwilt, has a discussion about negative space in modern quilts. I’m still trying to figure out what this means. 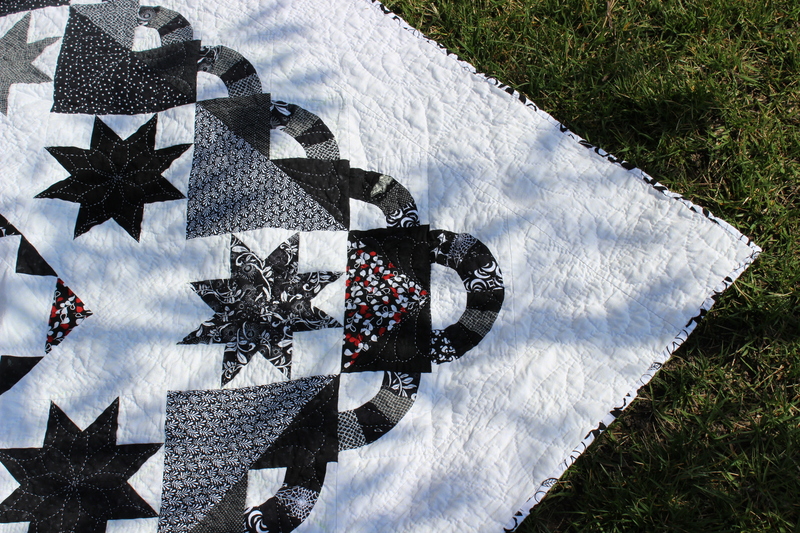 Again, my Vintage Moments quilt uses high contrast with the black and white. High contrast in a modern quilt must mean something more than that. The following photo is a quilt which won third place in the QuiltCon show for best handwork. This quilt (right) uses high contrast and graphic areas of solid color. I like bright and graphic colors but I’m also in love with muted colors which I think could be modern. I love improvisational piecing. I think “improvisational piecing” is akin to my understanding of “liberated” quilting. 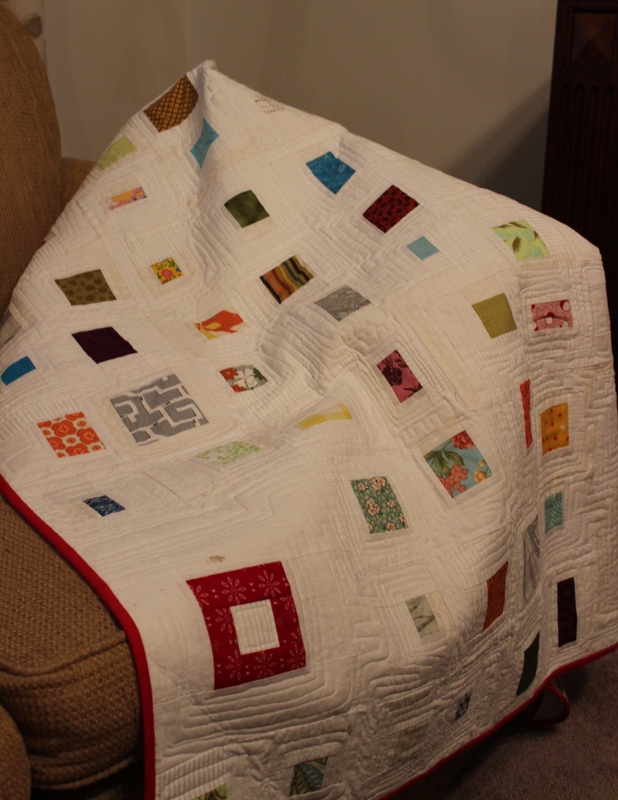 Last year I made a quilt from pieces of scraps from previous projects and quilts, mostly traditional. I made wonky log cabins but the “logs” were white or white-on-white fabric, also left over from previous quilts. I call it Sentimental Soup. This category seems the easiest for me to understand. Perhaps it is because I see it as Modern Art. This painting looks like a minimal quilt. I recently finished a quilt, titled Muppets Minimal. I know I named it ‘minimal’ and so it must be minimal. Right? This quilt is my husband’s favorite and is perfect for long naps. Functional – check. Expansive Negative Space– check. Bright and Graphic– check. Minimal– check. Improvisational Muppets– check. This must be a modern quilt. The LOVE quilt at the top of this post checks some of these blocks — improvisational, graphic, functional but not minimal and not much expansive negative space. This quilt is called, Love is messy, and is my tribute to the LOVEWorks sculptures throughout Virginia. The point is that a modern quilt doesn’t have to be all these things at once, and that just isn’t possible. Modern quilting is a new twist on the traditional art of quilting. This may mean something as simple as using a traditional quilt block and updating it in a fresh, fun new way. That includes using modern fabrics, modifying the block arrangement or even the scale of the block. The piecing could be improvisational and liberated, or it could be very exact and measured, following a pattern or creating your own. The quilting could be traditional stippling, clean straight lines, or a very “free,” fun, quilt-as-you-go style. Fabrics could be upcycled vintage sheets, custom digitally printed fabric, a yummy selection from one of the new modern fabric designers, or an old fabric from an ever-growing stash. Modern quilting is also about the attitude and the approach that modern quilters take. It respects the amazing artistry and talent of the tradition of quilting, while allowing the quilter to challenge the “rules.” In fact, if there were one rule in modern quilting, it would be that there are no rules. I like this description. THERE ARE NO RULES! I believe art, and modern quilts, must have some connection to the person who is creating the art or the quilt. Merely producing a replica of a piece of modern art is hollow. I have to find what speaks to me and what I want to create. I want my quilts to have a story. Update: after writing this post I realized I completely forgot about Alternate Gridwork which was the requirement for the QuiltCon Charity Quilt I helped make. Resources for just about every sewing tip. This is a great summary of all the components of modernism in quilting. Sometimes I struggle with what I believe my own definition of modernism is, but I appreciate having all these points laid out neatly with the pictures so I can wrap my head around the Modern Quilt Guild’s interpretation. Dylan, thanks so much. I corrected my mistake immediately. I appreciate you letting me know.